Pick up at your hotel in Phnom Penh and head north to Stung Treng where you will find a unique opportunity to see the unspoiled rural life of the Cambodia. Closed to Kampong Cham, visit Wat Nokor, a historic temple famous for the its impressive wall paintings, followed by a short tour of the provincial capital and its market. You will be guided to the rubber plantation where you will learn about rubber cultivation and production. A packed lunch will be served. Drive further to Stung Treng and check in at your hotel. In the evening, enjoy a special dinner of some delicious Khmer food at Tonle Toursim Training Center, where young locals are trained in tourism and hospitality. Overnight in Stung Treng. After breakfast, begin your tour of the day. Take a local ferry across the river and drive to Pheah Rumkel for around an hour. 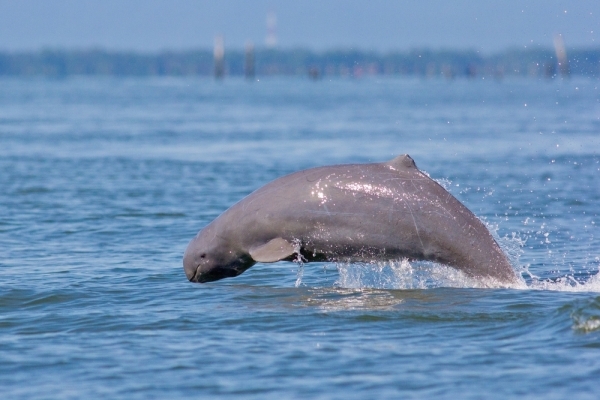 At Preah Rumkel, you will have an opportunity to watch the Irrawaddy Dolphins at Anlung Cheuteaol dolphin pool, one of the best spot to view the dolphins along the Mekong from the river bank. Continue further to visit the Sopheak Mitt Waterfall accessible by a 3 kilometer trek. 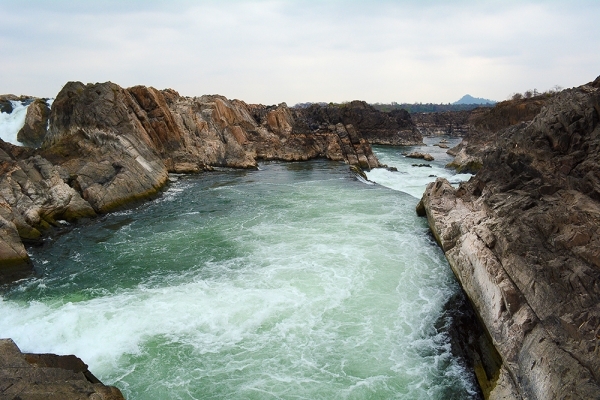 It is very close to Cambodia-Laos border and you can see a picturesque stretch of Mekong River along its path. A packed lunch is served at this scenic point. In the afternoon, return to Stung Treng. En-route visit the Mekong Blue, a local silk weaving center where the local disadvantage young women are trained to work in this remote area. You can see the workshops and shop for beautiful silk item that carry the UNESCO Seal of Excellence. (Mekong Blue is closed on Sunday). Breakfast at a local restaurant near the Stung Treng market. Drive southward to Kratie, and en-route visit Wat Sorsor Mouy Roy in the village of Sambo. The temple is famous for its 100 Pillars Pagoda, historical buildings and a legend. Inside the compound, you will find a small Turtle Conservation Center, where an endangered Cantors soft-shell turtles, the rare largest freshwater turtles in the Mekong River, are conserved. Further on to visit Wat Rokakandal, a 10th century temple renowned for its beautiful wall paintings, an island on Mekong River with typical Cambodian village life (Koh Trong is famous for its pomelo). Enjoy the environment at your leisure and overnight at the hotel on the island. Breakfast at the hotel. 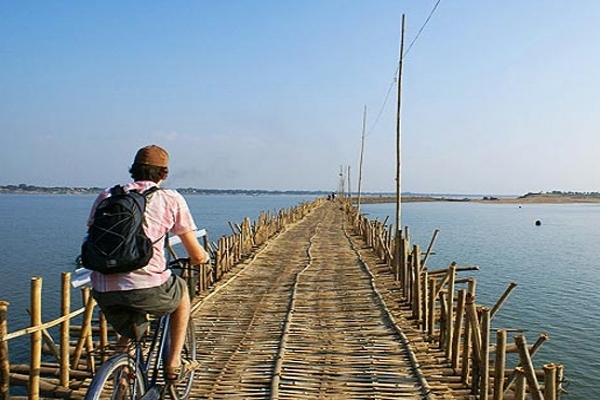 Today you will explore this remote island of the Mekong either by taking a local horse cart ride or pedaling yourself on a bicycle around the island. First stop is at the islands wat, where you can engage in a special activity, t tree planting project initiated by a farmer to restore a once densely forested island, by planting your own tree that carry your name tag and leave a positive trace on the island. 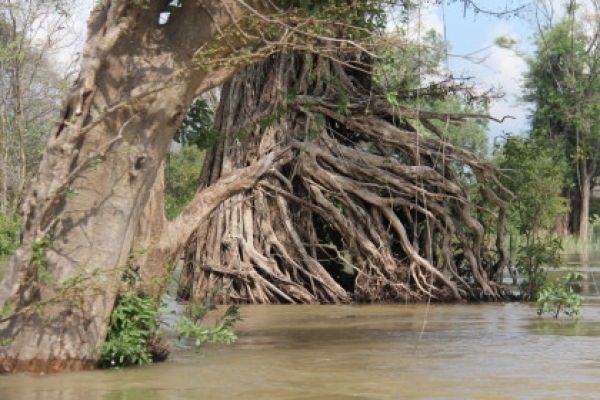 Enjoy a Khmer lunch under pomelo trees at a typical local house right by the river. Continue by the horse cart ride of bike around the island and visit a Vietnamese Floating Village on the southern tip of the island. Return to the hotel for relaxation. In the evening, you may enjoy seeing the spectacular sunset over the Mekong at Kratie. Overnight on Koh Trong Island. Breakfast at the hotel. Farewell the Koh Trong Island and Kratie and drive southward. En-route visit Chhlong, a small town with many French colonial houses that are among the most beautiful in Cambodia. Drive further to Kampong Cham. Lunch at a local restaurant and explore around this provincial town of Kampong Cham and its market. Continue to Kampong Thom and enjoy seeing the countryside of Cambodia. Overnight at Kampong Thom. Breakfast at your hotel. Visit one of the most important pre-Angkorian site - the Prei Kuk, build during the Chenla period between the 6th and 7th century with over well-preserved temples scattered throughout the forest. The seven villages around the temples still practice ancient craftsmanship of bamboo and rattan making. Enjoy your tasty lunch, prepared by the local community. 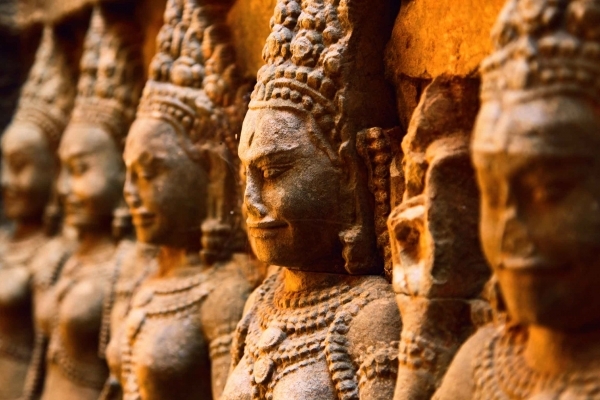 Continue further to Siem Reap and check in at your hotel for a short break. In the afternoon, experience a unique opportunity to visit the magnificent Angkor Wat on a typical Combodian Tuk Yuk. Built by King Suryavarman II in early 12th century, Angkor Wat is one of the major highlights of Southeast Asia and constructed following the design of the Hindu temple mountain symbolizing Mount Meru, home of the Hindu gods. The walls inside the temple are covered with stone carvings and bas-reliefs depicting Hindu mythology and the battle Suryavarman II fought during his reign. There are over 2,000 beautiful Apsara dancers decorating the temple. You will be at the Angkor Wat during the sunset. Breakfast at the hotel. In the morning, visit Taphrom, an unforgettable temple built in 12th century as it was left originally as it was found. 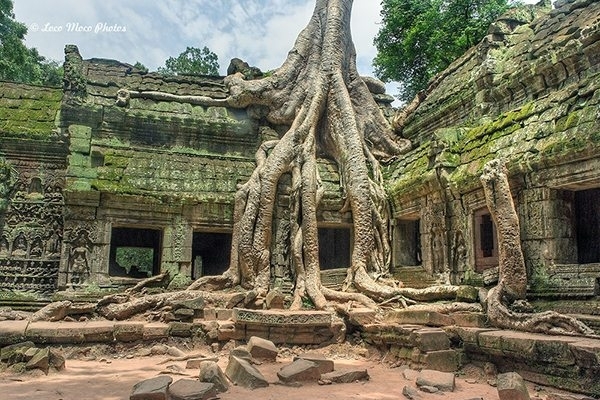 Trees and roots can be seen to overgrow over many parts of the stone temple. Form Taphrom, walk through the forest to the ancient capital of Angkor Thom, served as the last capital of the Khmer Empire. The city forms a perfect square, surrounded by 8 meter high walls. Pass through the ancient East Gate and see an impressive stone carvings of Elephant and four giant faces. 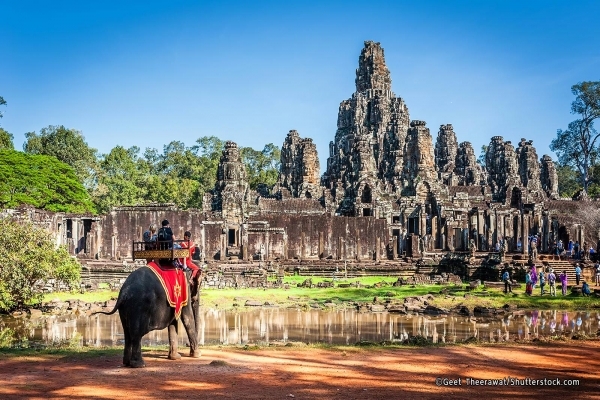 Continue to the mysterious Bayon temple, located in the center of the city. Is is consisted of 54 gigantic towers with four faces, representing the 54 provinces of the Khmer Empire. See the intricate Elephant Terrace and the Terrace of the Leper King. Lunch at Sala Bai, a hospitality training school where young Cambodians from poor family are trained in hospitality for their better future. In the afternoon, enjoy a scenic boat trip on the Tonle Sap Lake, the largest freshwater lake in Southeast Asia. See another phase of Cambodian life style on the lake. Visit Kampong Phluck, a floating village where you can see houses on stilts. (Note: Boat trip is possible from June to March. Due to low water level during dry season, an alternative floating village at Chong Kneas can be arranged instead). Breakfast at the hotel. Free at leisure until your departure. 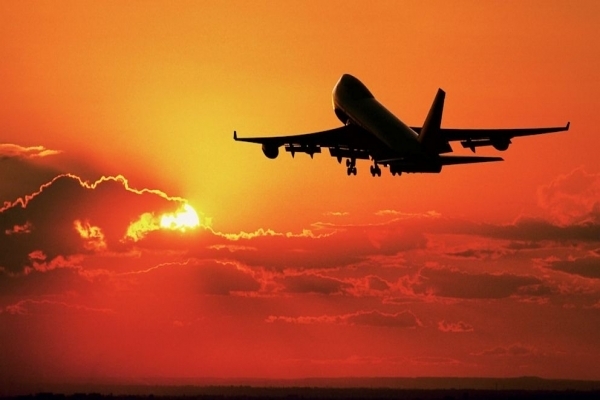 Transfer to Siem Reap Airport for your next destination.